Pope John Paul II has undergone surgery to help him breathe more easily, after being admitted to hospital with flu-related breathing problems. A Vatican spokesman said the operation to give the Pope a tracheotomy had been successful. The procedure involves making a hole in the throat through which a tube is inserted to assist breathing. The 84-year-old Pope spent 10 days in Rome's Gemelli Hospital earlier this month suffering flu symptoms. He went home on 10 February. Vatican spokesman Joaquin Navarro-Valls said the tracheotomy, usually performed under general anaesthesia, was completed in "a positive way" and lasted 30 minutes. The Pope, who gave his consent for the operation, will spend the night in his hospital room, Mr Navarro-Valls added. Medical experts say the operation is routine, but will make it more difficult for the Pope to talk. After being discharged from hospital two weeks ago, the Pope seemed to have been recovering well, appearing twice at his Vatican study window to greet pilgrims. 1 Feb: Rushed to hospital suffering from "breathing difficulties brought on by flu"
Earlier on Thursday, Mr Navarro-Valls said the Pope had suffered a return of flu symptoms on Wednesday afternoon and was admitted to hospital for further specialist treatment and checks on Thursday morning. Italian news agency Ansa said the Pope was conscious as he arrived at hospital. He is reported to have had breathing difficulties and a fever. The BBC's Robert Pigott says the Vatican has been keen to show the Pope's health in the best possible light to dispel speculation he may not be able to continue in the role. He says the pontiff has looked frailer since his admission to hospital earlier this month. On Wednesday the Pope gave a "virtual" general audience, addressing thousands of pilgrims via a television link from his study. Although he sounded hoarse, the 25-minute address was his longest public appearance since leaving hospital. But the pontiff, who has Parkinson's disease and arthritis, failed to attend a scheduled Vatican engagement on Thursday morning to approve the declaration of new saints. 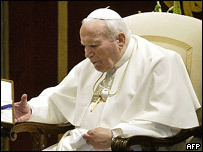 It was the first time he had missed the ceremony, known as a consistory, in his 26 years as Pope. During his previous spell in hospital, he had also missed Ash Wednesday services at the Vatican for the first time while pontiff. At times in the past three years he has had difficulty completing speeches and tires very quickly during public appearances. The appearance of the pontiff, with his bent frame and trembling hands, sometimes shocks pilgrims who attend audiences at the Vatican.